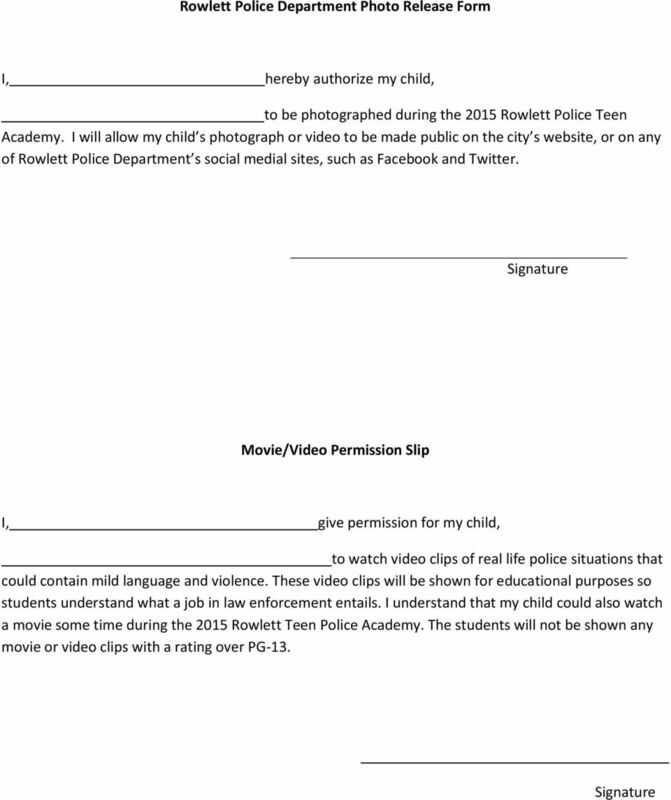 Download "Teen Academy one week program no cost June 22 to June 26, and July 20 to July 24"
1 Teen Academy The Teen Academy is a one week program designed to give the teens of Rowlett a working knowledge of the Rowlett Police Department. There is no cost to anyone who enrolls. The classes will provide an overview of the various areas of law enforcement, including special weapons and tactics (SWAT), crime scene investigation (CSI), patrol, first aid/cpr, defensive tactics, courts, Taser, etc. This is an educational and informative program that allows teens the opportunity to learn about the issues that affect law enforcement efforts in Rowlett, and help gain an understanding of how our criminal justice system works. The course dates for summer 2015 are June 22 to June 26, and July 20 to July 24 to be held at Coyle or Schrade Middle School (we will not know exact location until May). The Teen Academy consists of a series of classes and hands-on activities held Monday thru Friday from 8:00 AM to 3:00 PM. Lunch and water will be provided each day at no cost, with the exception of Friday. Classes are taught by members of the Rowlett Police Department in their various areas of expertise. Physical activities will be conducted on most days from 2:00 to 3:00. Physical fitness activities will be conducted in a gym and consist of a team sport and stretching. There will be a fun day on Friday, which will consist of a free trip to the Wet Zone; students will need money for anything extra they may want (games, food, snack, etc.). 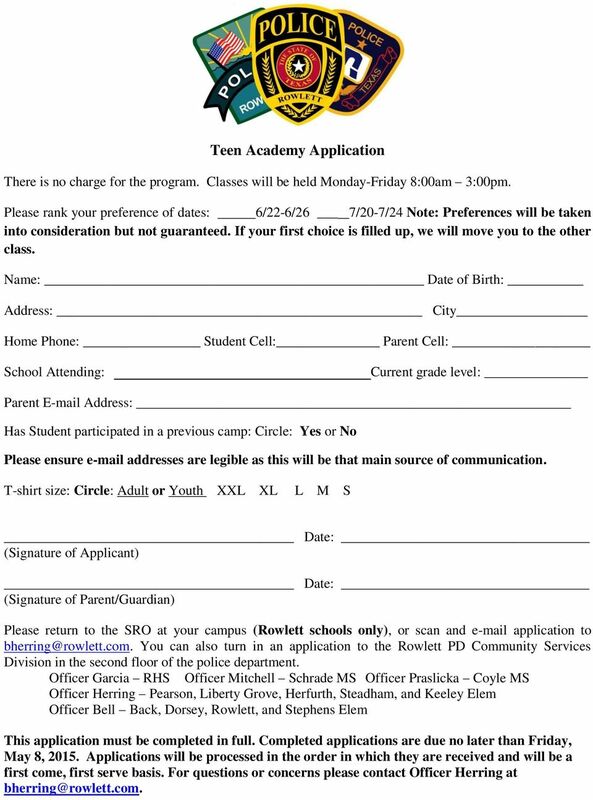 The Teen Academy is open to students who are currently enrolled in the 7 th to 11 th grade. Applicants must be currently enrolled in a GISD school or be participating in a home-school program and must be in good conduct standing. 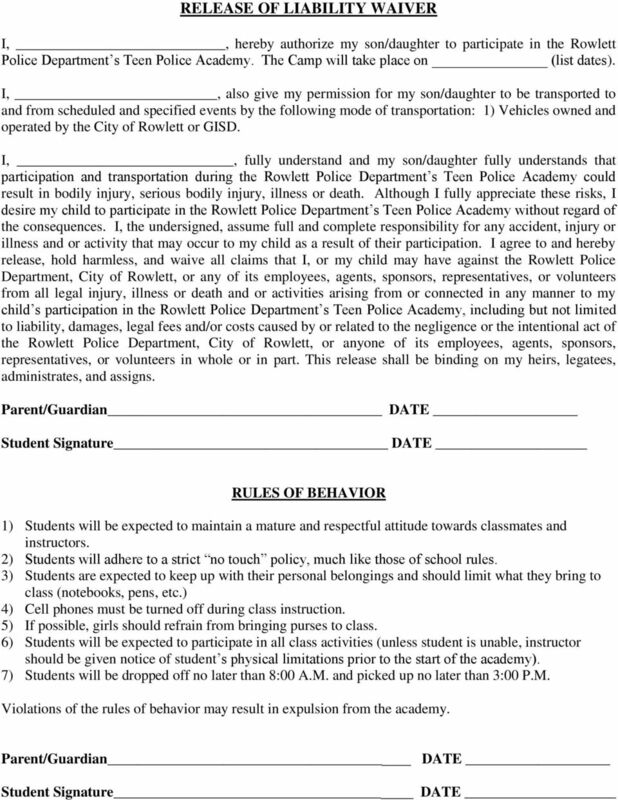 First priority will be given to students who reside in Rowlett. After submitting a completed application, students will be informed as to whether they have been accepted or not by May 15, Class space is limited, a completed application does not guarantee enrollment. The mission of the Teen Academy is to create a better understanding and communication between our youth and the Rowlett Police Department, enhance the students knowledge about law enforcement, and provide a positive interaction with police officers while educating our youth. We hope that all graduates of the Teen Academy will get to know more about the men and women who are protecting their community and why they make the decisions they do while performing that duty. 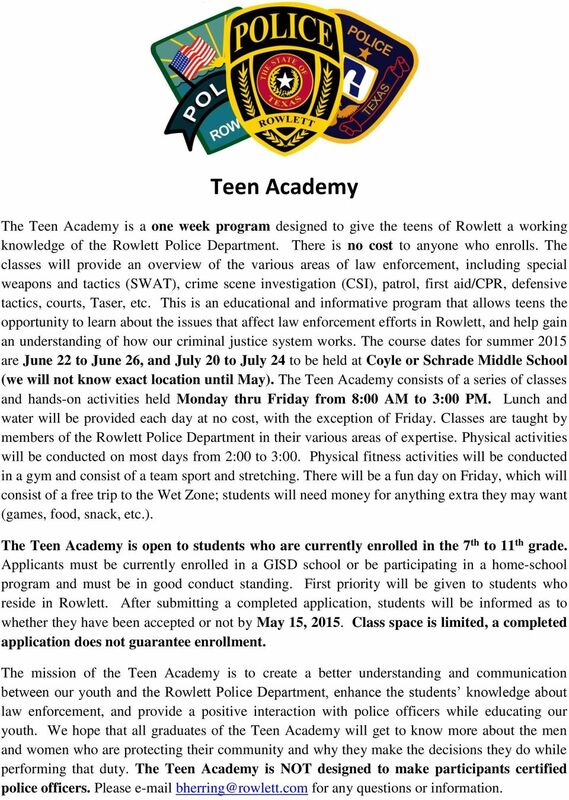 The Teen Academy is NOT designed to make participants certified police officers. Please for any questions or information. TOWN OF POUGHKEEPSIE POLICE DEPARTMENT INFORMATION PACKET OVERVIEW The Town of Poughkeepsie Police Department is seeking to provide an innovative program for youth residing in the Town of Poughkeepsie. Thank you for your interest in the Illinois Association for College Admission Counseling s 2015 CAMP COLLEGE program! Race Guide. South Portland. Check-In Party. Be Happy. Be Healthy. Be You. Welcome to The Color Run! Please note: Once your child leaves campus, he/she WILL NOT be allowed back on campus to participate in the after school program. LIABILITY RELEASE. Walk on Water Ministries 3330 Perkinson Lane Merritt Island, FL 32953 (321) 412-8057 Praisedancer.bryan426@gmail. 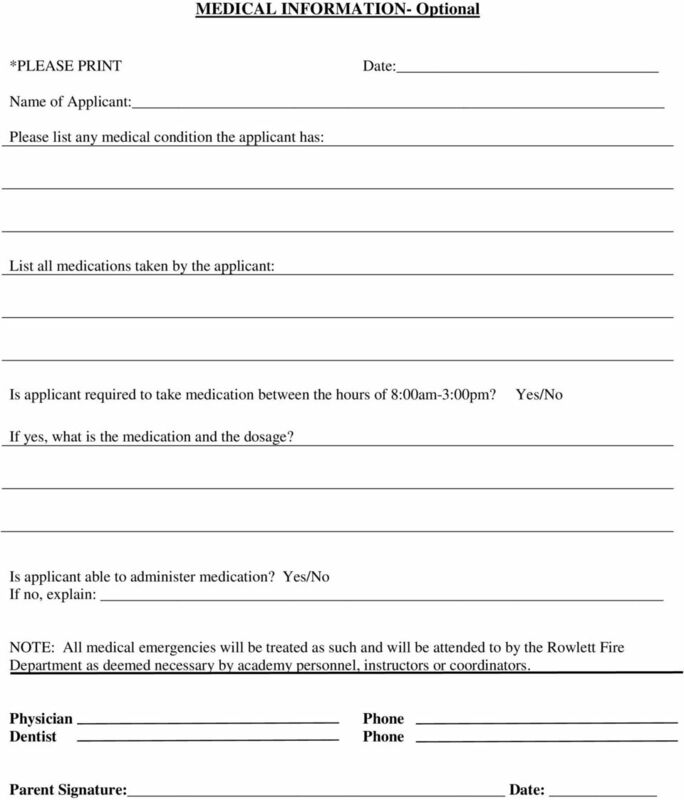 Parent Packet 700 Pelham Road North, Jacksonville AL 36265 Dear Parents! Welcome to a new and exciting time with the Learning 2 Mastery program. The hours of operation during the program are 3:15 p.m.
Stone Oak Athletics. We are looking forward to a fun-filled and safe summer with your camper. GATEWAY DISCOVERY CAMP SUMMER 2 0 1 6 REGISTRATION FORM Gateway Science Museum will host three sessions of the Gateway Discovery Camp. All sessions run 9am to 3pm and include daily snacks and lunches. Race Guide. Orange County. Packet Pick-Up. Be Happy. Be Healthy. Be You. Welcome to The Color Run! Emerald Hills Junior Golf Camp - Summer 2016. 938 WILMINGTON WAY REDWOOD CITY, CA 94062 www.playemeraldhills.com E-Mail - jrgolf.ehgc@gmail.